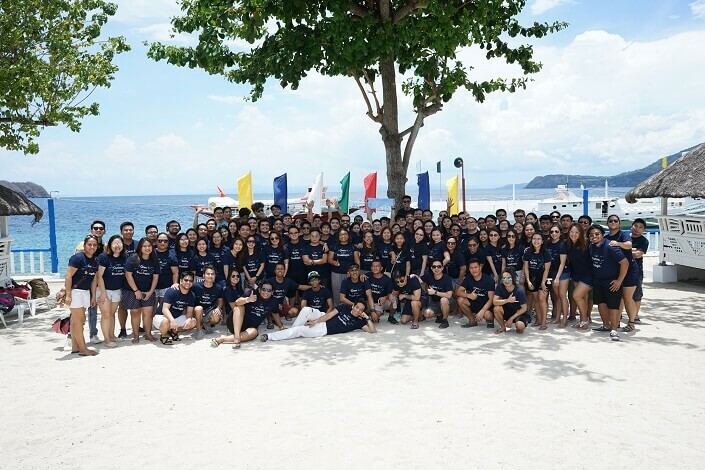 Last May 19 and 20, we stepped away from our desks and headed to the Olympic Point Island Resort in Tingloy, Batangas, where we held #SweatEatOut2018, Truelogic’s annual summer outing. 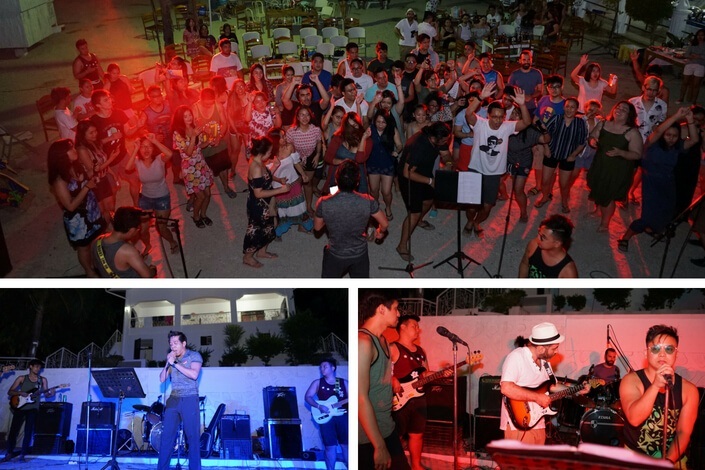 Of course, it’s not just any outing; the company’s musicians and athletes got their chance to shine in this year’s activities. We left Makati quite early and headed south for Batangas. The trip took much longer than expected when our buses encountered a few bumps on the road – literally. But busted air conditioners and steep roads were not enough to dampen our spirits. By the time we made it to the boats that would ferry us to the island, we were all very excited to see what was in store for us. It’s hard to miss the resort as you approach the island – just watch out for the white and blue structure sporting colorful flags (and maybe the giant tarp with its name on it, too). Loud fanfare welcomed our arrival, courtesy of the #SweatEatOut2018 planning committee, who arrived the day before to make sure everything was set. With a nice fruity drink to cool off and a lunch buffet waiting for us shortly after, we finally settled down after our long trip. Instead of hosts Keith, Will, and Coey grouping us, we found our teammates through an icebreaker activity designed to help us know each other better. We were then sorted into six teams: Green, Yellow, Red, White, Light Blue, and Dark Blue. 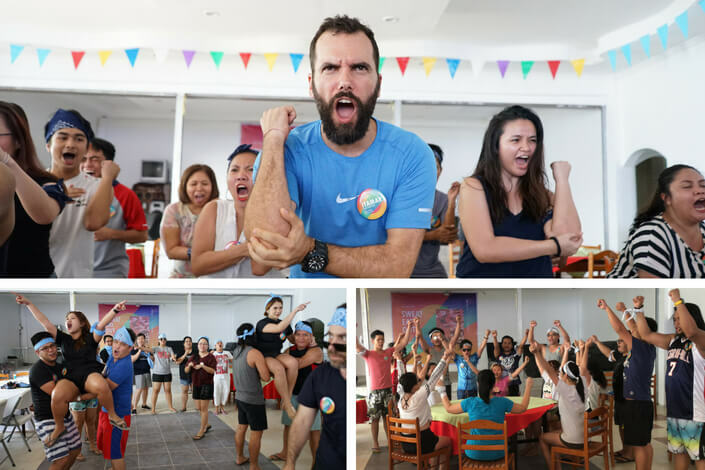 For the first activity, each team presented its own version of haka (war cry performance). All teams gave unique and astounding presentations, but the win went to the Light Blue Team, who wowed the audience with their lifts. They earned an advantage for one of the activities. Teams gave their all for their haka, but the win went to the Light Blue Team. 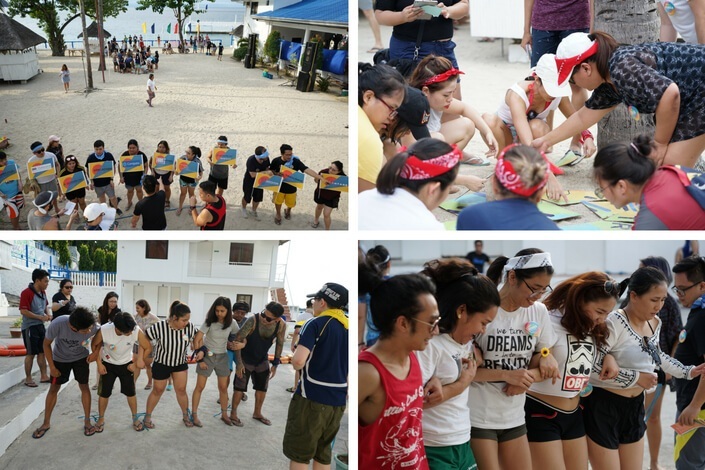 The activities continued with the treasure chest, little boxes containing the order of activities for each team. Each box is secured by a combination lock, which the team has to unlock by solving a set of riddles. The different activities took place in different areas of the resort. 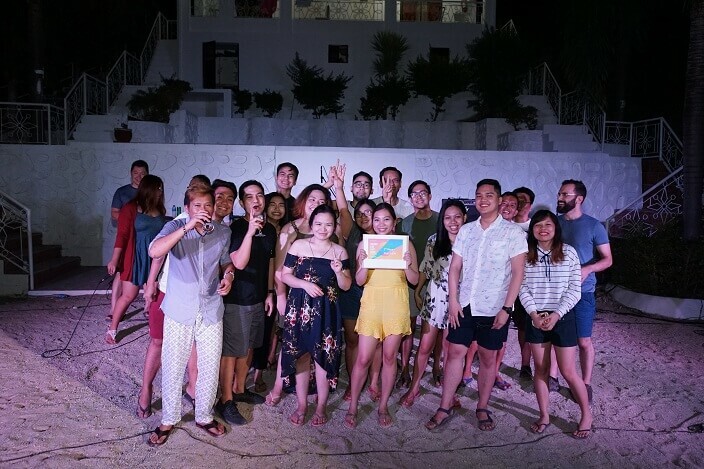 At the volleyball court, our memories were tested as teams pieced together Truelogic’s history and milestones, and completed a puzzle featuring the latest logos of the departments. At the basketball court, teams strategized and worked together to complete the Five-Man Strut. Down at the shore, teams swam and paddled to achieve the fastest time for the Kayak-Swim Relay. We then gathered for one last challenge: a water gun fight. 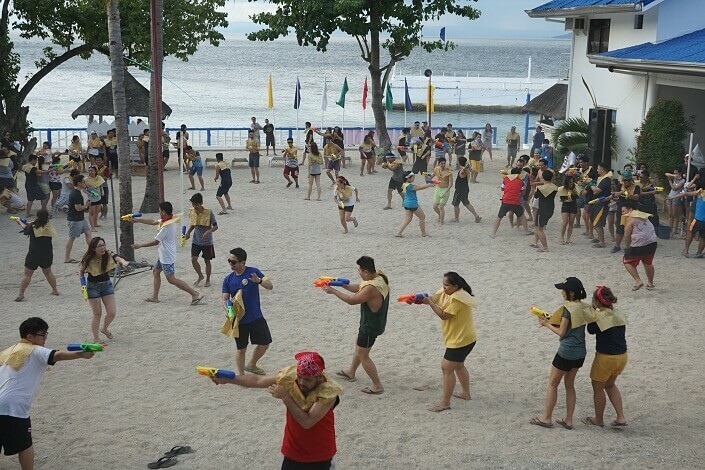 Equipped with paper bibs and water guns, teams had to douse rival teams. The team with the five cleanest members wins. As a reward for winning the haka activity, the Light Blue team got a bigger, more powerful water gun, on top of their individual guns. For 15 minutes, #SweatEatOut2018 turned into Holi 2018 as everyone was doused with an array of colors. All shyness and hesitation disappeared as each team fought to protect their teammates and spray opposing teams. After the games, most of us proceeded to Olympic Point’s spacious (and salty) pools. Others assembled for billiards, kayak, and basketball. At sundown, we all began preparing for dinner and True Sessions. The hosts, together with General Manager Bernard and CEO Itamar, announced the winners. In 3rd Place was the Green Team, and ahead by one point was the Light Blue Team at 2nd Place. Despite their weak start at the haka, the Yellow Team made a strong comeback and emerged victorious. This year’s winning team, the Yellow Team. For the rest of the night, Truelogic was entertained by our very own band and musically inclined colleagues, who kept the party going until the wee hours. Shout out to Jigger, who rapped some lines he made just for Truelogic! It was an unforgettable experience as many of us loosened up and mingled with colleagues we never really get to speak to on a regular day. With the drinks, music, and the rest of our Truelogic colleagues, it was safe to say that everyone enjoyed the night. Those who could ignore their hangovers took advantage of the rest of the morning, enjoying the amenities and joining the board games, Bingo, and other morning activities planned. Unfortunately, we couldn’t stay there forever. By noon, we were on the boats heading back to the city. Overall, #SweatEatOut2018 was a fun-filled experience that brought everyone together with music, food, and games. Until next year! See you at #SweatEatOut2019! We’re already excited for next year’s outing and hope you will join us, too! Visit our careers page to see what’s in store for you at Truelogic!